GM#117 is a spacious, 2,172 sq. 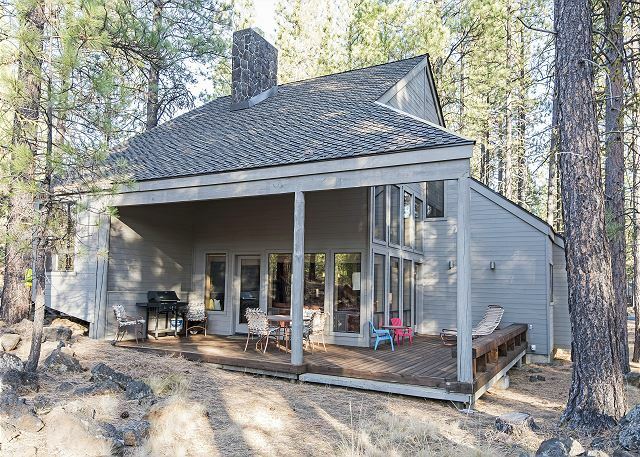 ft.vacation home very close to the Glaze Meadow Recreation area. 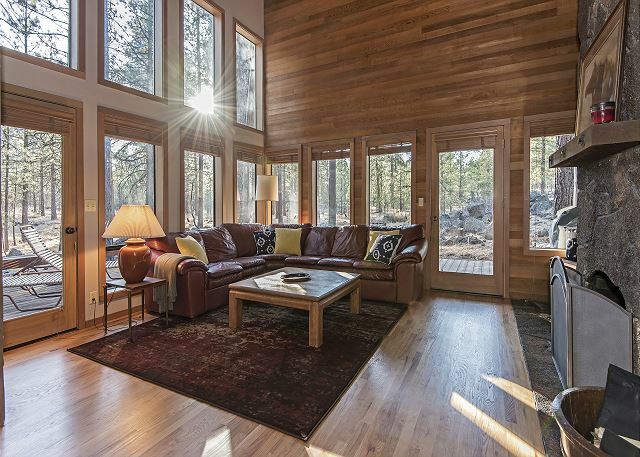 An open floor plan, soaring vaulted ceilings, and warm wood throughout, make it the ideal contemporary getaway. Take advantage of all the ranch has to offer with your pup too! This home is dog friendly. 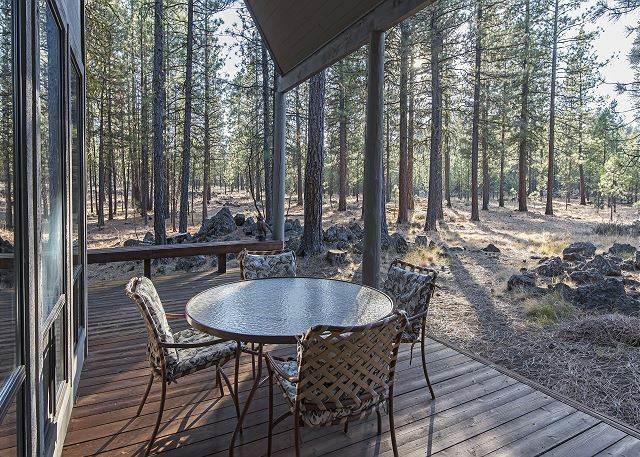 The spacious back deck offers an open space to take in the natural beauty of this property. 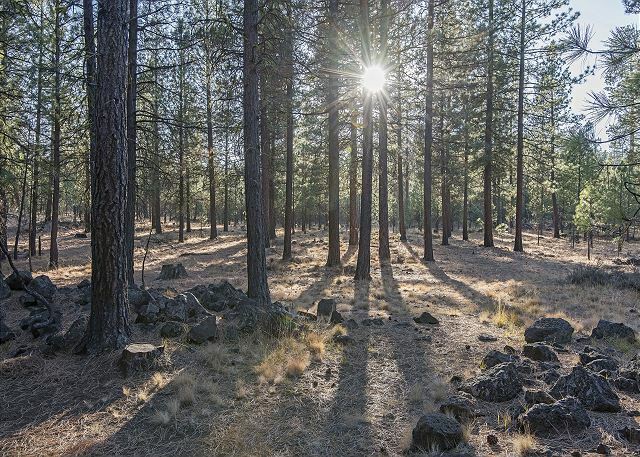 The home backs on to Forest Land, providing privacy and unobstructed views of amazing Ponderosa Pine trees, millennia old lava rock outcroppings, and if you're lucky, a family of deer strolling by. For those snowy evenings, the covered deck provides reprieve from the elements when cooking on the outdoor grill. 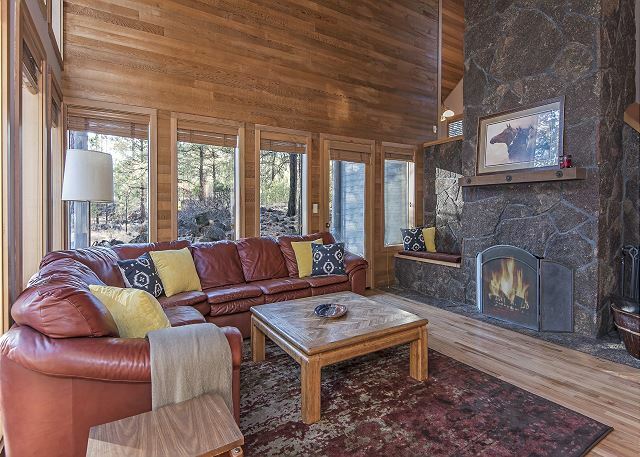 Cozy up on the large leather sectional in the great room and bask in the sun streaming through the double height wall of windows. Or, on those cooler nights, enjoy a fire in the magnificent free standing wood fireplace wrapped in natural lava rock. From the great room follow the hallway down to a full bath, queen bedroom and kids' room with two sets of custom built bunk beds. 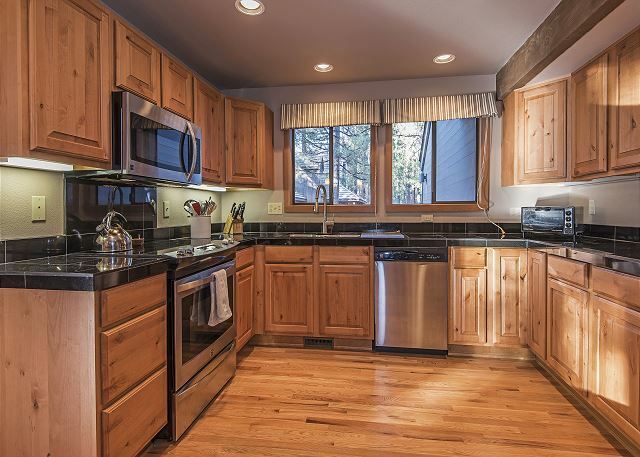 Open to the great room is an updated kitchen with beautiful pine cabinets, stainless appliances, granite counter tops and an eating bar. Enjoy family mealtimes in the dining room, just seven steps away from the kitchen. 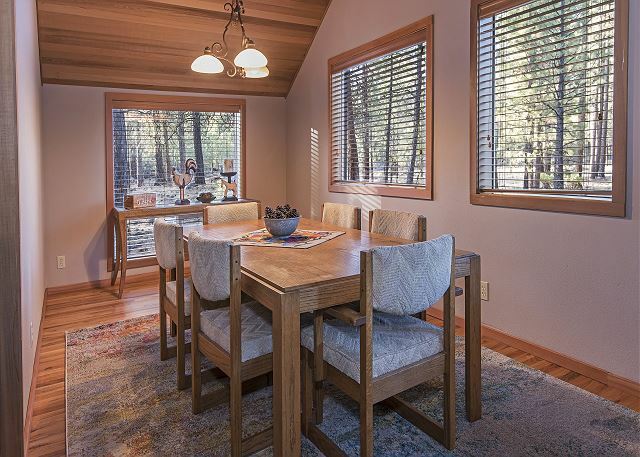 Like the great room, the dining room is light and bright, with beautiful views. Continue up the same set of steps to the second floor where you will find the king master suite and jack and jill bathroom. A family room completes the upstairs for casual entertaining with a 55' 4k flat panel television, video and board games. Feel free to store all of your outdoor toys in the attached garage, outfitted with an additional refrigerator and even a ping pong table! The home is also well equipped for your little ones, with booster seats, a pack and play and kids' step stools. GM#117 is only a short walk or bike ride away from the Glaze Meadow Recreation and Spa area where you and your family will enjoy biking, hiking, swimming, golf, tennis, pickle ball, bocce ball, horse shoes, and more! 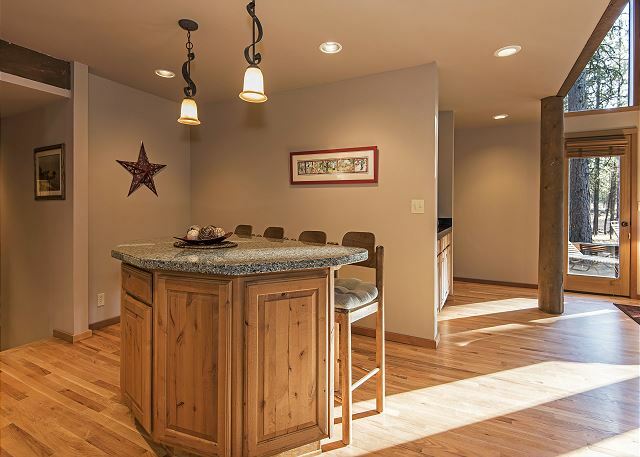 This home is close to endless recreation for the whole family and you will want to return again and again. As usual Black Butte didn't disappoint. Love being there in the calm serenity of the trees and this house didn't disappoint. It's well appointed and cozy for the whole family. We appreciated the two different family rooms and that there were soft blankets to use while curling up with a book. Beds were comfortable and the kitchen was well stocked and there was room for your own food!